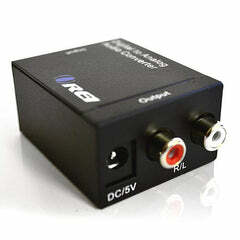 Converts S/PDIF or Optical (Toslink) to analog R/L Audio signal with selectable switch for coaxial or optical input. Make sure the the plastic removed. And the Optical Cable is pushed in completely. TROUBLESHOOT: Signal from the TV goes into SPDIF (Optical), or Coxial input of the DA34 and The output of RCA or Headphones will go into your analog speakers or headphones. Make sure the power adapter is connect properly. And all the cables are inserted all the way in. If there is still no sound, please change the TV Audio out to PCM Only from the TV Menu. 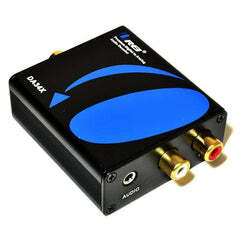 Supports Digital Audio Input: SPDIF, Coaxial with Selectable coaxial or optical switch. 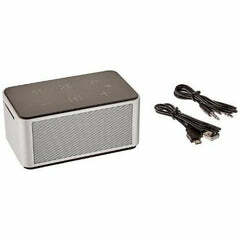 Premium Quality with Durable Metal Casing, Easy to Use, Just Plug and Play, No installation required. 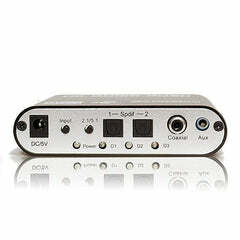 Connect to home theater or a 5.1-channel power amplifier (FL/FR if 2.1 channel). 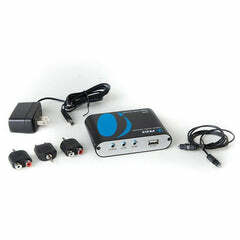 USB output: Supply 5V power to 5.1 Channel Headphone. This Device will not convert Dolby Sound. 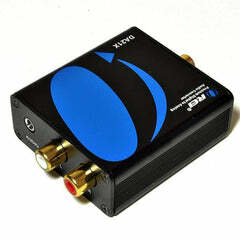 It is only a converter not a Decoder. So make sure your device does not require Dolby conversion.